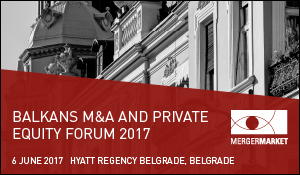 Serbian Private Equity Association is proud to announce its partnership with the Balkans M&A and PE Forum. The event is being held at the Hyatt Regency Belgrade, June 6th. Attracting 150 attendees and 25 speakers, it will bring together corporates, private equity houses, investment banks, corporate finance advisers and law firms to forge relationships and set the agenda for the year ahead in deals. This year’s program aims to address the concerns of the market through interactive debates and case studies. •	What is the anticipated economic growth for SEE in the next 5 years and where? •	What still needs to happen to facilitate more growth of M&A in the region? •	What is China’s Balkan’s strategy? What will we see from these investors?